School Education - Un-Aidc::d Private Educational Institutions - Certain instructions - Issued. 1. G.O.Ms.No.l, Edn., dated 01.01.1994. 2. G.O.Ms.No. 41, Edn.,(SE.PS.I) Dl. 11.05.2006. 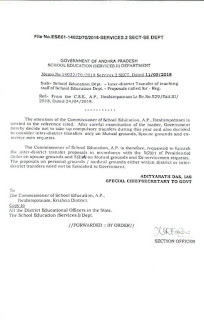 "the Educational agency shall submit the Annual Administration Report in the prescribed proformato the competent authority for very financial year by the 30th September at the latest. SUch report shall be supported by the audited statement of accounts of the school duly audited by Chartered Accountant. Separate accounts shall be maintained for each school. Similarly the educational agency, which is running more than one school, shall also submit such returns within the stipulated time to the competent authority. Managements should ensure to pay the minimum salaries to the teachers by 1st of every month through bank. 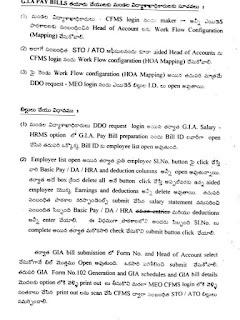 All the managements should submit their Annual Administration Report in the prescribed proforma to the competent authority for very financial year by the 30th September. The Inspecting Authority (Deputy Educational Officer/ MEO) inspect and verify the accounts including payment of the salaries and other benefits like Gratuity, Teachers Provident Fund, Group Insurance Schemes etc., to the staff. All the managements should upload the fee collected by them during the academic year 2017-18 in cse.ap.gov.in website. 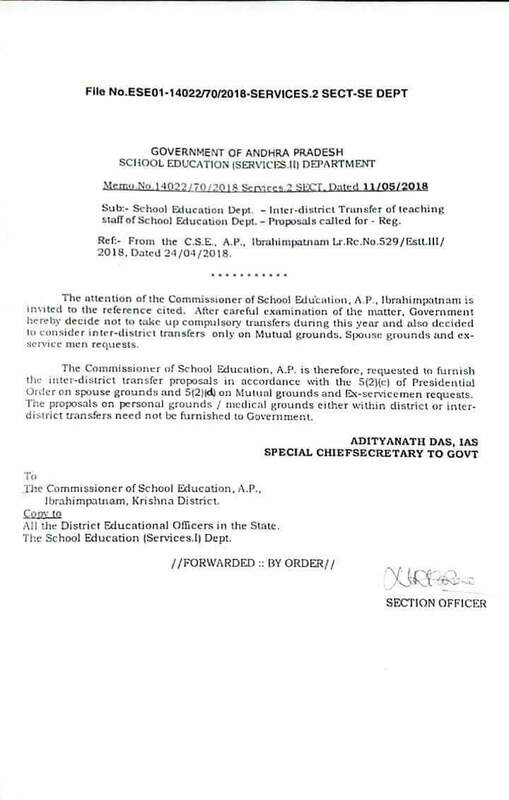 All the managements should also upload the fee to be collected by them for the academic year 2018-19 in cse.ap.gov.in website and also display in two prominent places visible to public in respective school premises. Implementation of GNANA DHARA in Municipal Schools and other interventions during the summer vacation. as 7.6% per annum with effect from 01.04.2018 to 30.06.2018 for the year 2018-19 G.O.Rt.No.1204 Dated: 22.05.2018 issued. SE - TWO DAY EDUCATIONAL OFFICERS ANNUAL WORK SHOP IN RESIDENTIAL MODE WITH ALL RJDS,DEOS,POS, orders issued. వేసవి సెలవుల్లో పాఠశాల విధులు నిర్వహిస్తున్న ఉన్నత పాఠశాలల ప్రధానోపాధ్యాయులు విధిగా బయోమెట్రిక్ హాజరు నమోదు చేయాలని, దానికి అనుగుణంగానే వేతనంతో కూడిన శలవును మంజూరు చేయాలని,అందుకు తగిన ఆదేశాలు జారీ చేయాలంటూ జిల్లా విద్యాశాఖాధికారులకు CSE ఉత్తర్వులు. ◆ Mininimum 2 years service in present cader only need apply. ◆ Spouse(Employees state/ central/ public under taking) and mutual&Exservicemen only eligible two apply. DSC 2014 వాళ్ళు జూన్ 1, 2016 న జాయిన్ అయ్యారు. వారికి జూన్ 1, 2018 కి 2సం. లు నిండుతాయి, కానీ ఇంటర్ డిస్ట్రిక్ట్ ట్రాన్స్ఫర్స్ కి అప్లై చేస్తే Not eligible అని వస్తుంది. Online problem సరిచేయాలి. Inter state transfers issues relating to teachers/lecturers in mutual transfers particularly cases where mutual transfers involves teachers/lecturers who are not of the same subject constitution of committee orders issued. Dr B. R. Ambedkar Open University invites applications from eligible candidates for admission into M.Phil. & PhD. programmes in English, Hindi, Telugu, Business Management, Commerce, Education, Chemistry, Environmental Science, Mathematics, Physics, Economics, History, Library & Information Science, Political Science, Public Administration and Sociology for the Academic Year 2018-19. BRAOU Notification for Admission into M.Phil. & Ph.D. Programmes - 2018-19. A candidate should possess Master’s Degree in the subject concerned from a recognized university, with a minimum of 55% (50% in the case of SC/ST candidates) of marks for admission into both M.Phil. and PhD. programmes. Admission into M.Phil. and PhD. the programme shall be through an entrance examination (written test) followed by an interview. However, the applicants qualified at the UGC/CSIR/JRF/NET/SLET/M.Phil./GATE tests are exempted from appearing for the entrance test provided they register themselves for the admission by paying the requisite fee. The medium of instruction and examination for M.Phil. and Ph.D., entrance test, coursework and writing dissertation/thesis shall be English only. In case of languages, the medium of instruction and other activities shall be in the language concerned. "The Registrar, Dr B. R. Ambedkar Open University, Hyderabad”. Separate applications have to be submitted for M.Phil. and Ph.D.programmes if the candidate wants to apply for both." The filled-in applications should reach “The Director (Academic), Dr B. R. Ambedkar Open University, Prof. G. Ram Reddy Marg, Road. No. 46, Jubilee Hills, Hyderabad - 500033” on or before 18.06.2018. The Special Chief Secretary to Government, Finance Department. The Secretary to Government (F.P), Finance Department. All Special Chief Secretaries/Principal Secretaries/Secretaries/Ex-Officio Secretaries to Government. All Heads of Departments/Collectors & District Magistrates. The Chairman, A.P. 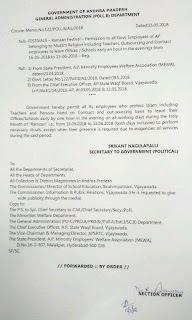 Secretariat Employees Co-ordination Committee, Velagapudi. 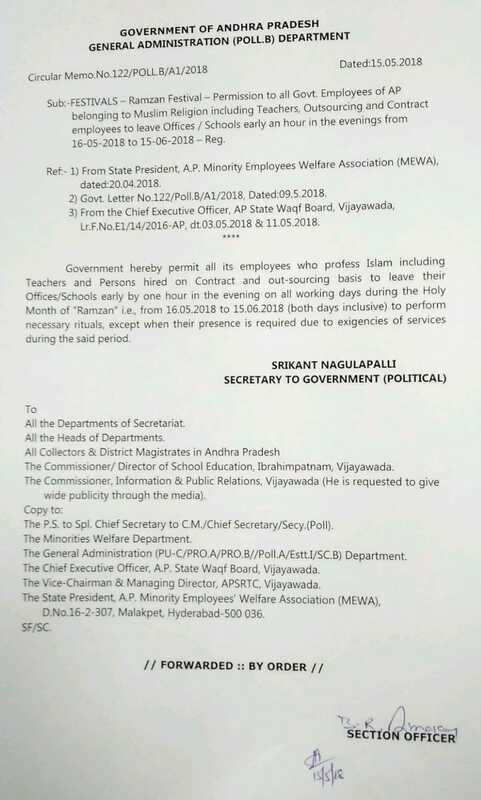 The Chairman/Co-Chairman/Secretary General, Joint Action Committee of Employees, Teachers and Workers, A.P. The General Administration (SW)/Estt.I/Estt.II/Poll.B) Department. The Special Chief Secretary/Principal Secretary/Secretary/Additional Secretary to The Chief Minister. The P.S. to Chief Secretary/Secretary (Poll)/Joint Secretary (AIS). The Finance (PC.I) Department, A.P.Secretariat, Velagapudi. పిఎఫ్ లోన్లు, ఫైనల్ పేమెంట్లు చెల్లింపు గురించి ఆర్థిక శాఖ ఉత్తర్వులు.. Spouse, Mutual and Request transfers and schedule is sent to RDMAs, Commissioners. Copy of the circular is furnished below. Municipal Teacher’s Transfers – Mutual, Spouse Cases & request transfers from one District to other District and within the District. Municipal education foundation course programme printing of work books & study memorial and distribution yo students of classes I to V and VI to X printing and supply for the academic year 2018 - 19 administrative sanction accorded orders issued. ఈ నెల 17-05-2018 మరియు 18-05-2018 లలో DEE CET - 2018 జరగనున్న నేపధ్యంలో ఆ తేదీ లలో జరగవలసిన ఇంటర్ అడ్వాన్సు సప్లీమెంటరీ పరీక్షలను మానవత దృక్పథంతో 23-05-2018 మరియు 24-05-2018 కి వాయిదా వేస్తున్నట్టు మరియు దాని అనుగుణంగా ప్రాక్టికల్ పరీక్షల మార్పును సూచించారు​. Yoga booklet issued by government of India. It helps to get rid of many health issues. Inter District Transfers MemoNo 14022/70/ 2018 dt 11-5-18 released. Comprehensive budget release order for rupees *one thousand two hundred forty seven crores thirty three lakh fifty seven thousand only(12,47,33,57,000)* - Quarterly Description of budget for the *school education* department. Non Teaching Staff Transfer Application Form by school Education. సర్వీస్ రెగ్యులరైజేషన్, ప్రొబేషన్ డిక్లరేషన్ కొరకు DEO కార్యాలయం నుండి MEO లకు mail లో పంపిన ప్రొఫార్మాలు.